Effects Oriental arborvitae, Italian and Monterey cypress. Found in the Western Coastal U.S.
With Rain or foggy, cool weather or infested pruning tools. The Blight on Small branches become reddish-brown, many dropping; larger limbs girdled. Twigs with black pustules of fruiting structures (acervuli). Foliage becoming gray. Dead twigs become entangled at base of tree. 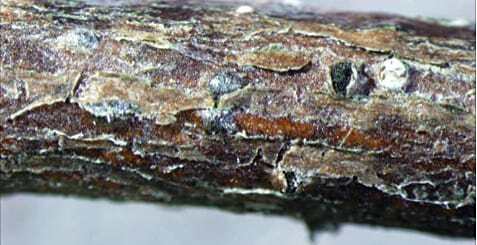 The Cankers on twigs and branches girdled, with cankers first appearing on lateral twigs; slightly sunken, dark, resinous, rough, with black spore pustules. Yellowing and browning of foliage with gummy ooze at cankers. Infection is first evident in upper part of tree during moist spring. Following initial infection, acervuli produce spores which drop to lower branches or are spread in windblown rain and fog or by birds and insects. Repeated infection leads to death of tree.